Contact a member of our friendly staff today. The Fagan Family are delighted to introduce to you Ailesbury Private Nursing Home, owned and operated by the Fagan Family since 1989. 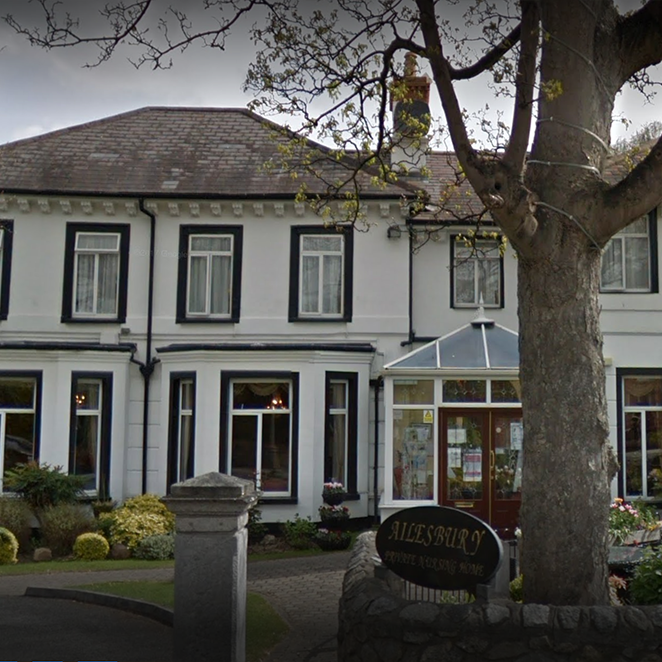 Ailesbury Private Nursing Home is located on Park Avenue, in Sandymount, Dublin 4. Ailesbury Private Nursing Home is an attractive, detached protected structure, abounding with charm and stature in its own private grounds, complimented with a pretty garden area to the front. Sandymount Strand is a short walk away, as is Sandymount Village, ensuring that residents and visitors can still experience all that the wonderful area has to offer. Upon entering Ailesbury Private Nursing Home residents and their families will immediately sense the warm and homely atmosphere, creating an environment where residents feel secure, well cared for and very much “at home”. Our residents, their families and visitors appreciate that the small and traditional style of Ailesbury Private Nursing Home has benefits far and beyond the homely atmosphere. The relatively small number of residents and the consistent and highly skilled team of healthcare workers ensures that strong relationships are built between the staff and residents which has immeasurable benefits for the residents, families and staff alike. We have a choice of two sitting rooms, a quiet lounge, a conservatory where visitors and residents can relax and spend time together and a tranquil garden area to the front. All bedrooms are equipped with telephones, Satellite Televisions and Wi-Fi, along with infra red nurse call systems for residents with specific safety needs. We have a lift which serves all floors and a private car park to the front of the house. Ailesbury Nursing Home is registered with HIQA and all other relevant authorities. Among its many services Ailesbury Private Nursing Home offers its residents daily delivery of newspapers, hairdressing, laundry, physiotherapy, occupational therapy, dietetic and nutritional support as well as a limitless array of activity therapies. We celebrate Mass each week and have strong contacts within the community who support our residents of varying denominations. In addition, our 24 hour nursing and care team are on hand to ensure that all nursing, medical, and social needs are tailored to and catered for. Our wheelchair accessible bus guarantees that we can transport our residents not only to medical and hospital appointments, but that we can offer our residents the choice to partake in trips to see a show, or visit a local attraction. Our dedicated Activities Team ensure that regular outings are a priority, and they continuously strive to incorporate new outings in to our resident’s activity schedule. Other areas of our service include Dementia care, Palliative care, Convalescing and Respite and Day care. A full list of outings / activities / services is detailed in our information booklet. Our aim is to provide, encourage and facilitate our residents to live as full and stimulating a life as possible. We believe that as we age, our minds and bodies thrive on being kept active thus encouraging our residents to participate in active retirement and social engagement is a cornerstone of our care delivery. Our nursing and care staff are qualified, educated and highly skilled. They are encouraged and assisted to regularly update their knowledge and training so as to deliver person- centred care of the highest standards and quality. All catering is done on site and prepared freshly each day, with our home baking now renowned amongst visitors and residents, past and present. Our afternoon Tea takes central stage each afternoon, to the extent that physios and dieticians admit defeat once the clock strikes three pm. Due to its many fine facilities Ailesbury Private Nursing Home is sure to appeal to those who wish to engage and socialise, as it is to those who prefer to while away their time in moments of tranquil relaxation and quiet. We encourage any prospective residents and their families or friends to visit us and experience the comfortable and homely atmosphere in Ailesbury. We invite you to make an appointment with our accommodation and enquiries manager for a viewing and to obtain further information. Our 24 hour nursing and care team are on hand to ensure that all nursing, medical, and social needs are tailored to and catered for. The relatively small number of residents and the consistent and highly skilled team of healthcare workers ensures that strong relationships are built between the staff and residents which has immeasurable benefits for the residents, families and staff alike. Ailesbury Nursing Home is registered with HIQA and all other relevant authorities. Family Values – Our Team! The Fagan Family have deep roots in the care sector, and since 1989 have been at the helm of nursing home care in south Dublin. They adopted the operating name of ANH Healthcare Ltd in 2014. The ethos of ANH healthcare Ltd is one steeped in family values, and as such, the Fagan Family have a very hands on approach in the management of both Ailesbury & Ashbury Private Nursing Homes. Robert and Ursula Fagan purchased Ailesbury Private Nursing Home in 1989. They expanded the nursing home over the years to a 46 bedded nursing home, and in 1998 Robert Junior came on board to work within the family business. The Fagan Family acquired Ashbury Private Nursing Home in 2001. Alison, their daughter joined the team in 2002, after completing her nursing studies in the UK, and furthering her education again in Trinity College, Dublin in 2003. As a team, they refurbished Ashbury Private Nursing Home in 2005, restoring the original house to its former glory, and subsequently in 2012 further refurbished The Grange Wing of Ashbury Private Nursing Home, giving a current capacity between both wings of 99 residents. Today Robert Jnr holds the role of Registered Provider of both Ailesbury & Ashbury Private Nursing Homes while Alison holds the role of Person in Charge and Director of Nursing. Robert and Alison have been joined in ANH by their respective spouses, Wendy and Adrian and they are further supported by their dedicated management team. We, the Fagan Family are proud to promote both establishments as being family managed and operated. Our hands on approach leads to developing strong relationships with our residents and their families which enables us to deliver care that is tailored to the individual needs of our residents. This is further enhanced by the dedication and commitment displayed by our qualified and experienced staff. We firmly believe in and consistently promote and encourage an ethos of openness, honesty and transparency within our homes and we very much welcome feedback from all of our residents, their family members and their friends. We are always aware of the onerous responsibility we have in caring for our elderly members of society. Our daily aim is to provide an excellent standard of care to our residents and to enable them to live out their lives with us in the comfort and dignity they deserve. “Ailesbury have been one of the best decisions my parents have made. The team are caring, kind, honest and compasionate. They have been more than happy to answer any queries we have had in a timely and professional manner. Mam and Dad are happy and healthier than ever. Please submit your enquiry below and a member of our staff will be in touch shortly.